We find ourselves focusing once again on Joseph Ratzinger, Pope Emeritus, after a controversial tribute was read to him in the Cathedral of Cologne, by Archbishop Georg Gänswein, Saturday morning, at the funeral of his friend Joachim Meisner, with words that in many passages refer to the present crisis in the Church. Let’s not forget that Meisner was one of the four Cardinals who sent Pope Francis, last September, their “dubia”, meaning their doubts, about Bergoglio’s liberal approach to the Faith in his Amoris Laetitia. Controversy of course erupted in the Vatican after Benedict XVI, touching words were read in memory of his great friend, under the vaults of the magnificent Cathedral, and even if very diplomatic, they still rise questions about Meisner’s sudden death, and filter a not so mild form of criticism towards the present state of the Vatican from Pope Emeritus. “We know that for him, a passionate pastor, it was difficult to leave the Office, precisely at a time when the Church needs pastors, who can resist the dictatorship of the spirit of the time, and know how to live with faith and reason”. 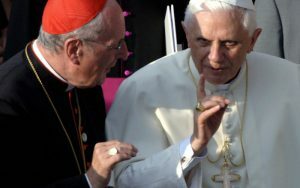 So Ratzinger talks openly about “dictatorship of the spirit of the time” addressing in a not so mild fashion, the modernization imposed by Bergoglio, adding this about Meisner, and the state of the Church: “He lived in this last period of his life, with an increasingly deep certainty, that the Lord does not abandon his Church, although sometimes the boat filled up almost to capsize and could turn over”. Only twelve years ago Ratzinger described the Church as a “small boat of thought of many Christians … not rarely shaken” by waves of ideological fashions, but now the situation is much more chaotic and dangerous. Fascinating. Just today I read of a new endorsement of this pope’ s desire for a world government in which he dared to say the U.S. should be willing to submit to! It made me think yet again of the deeply important book by by Leo about this pope and his dark, evil plans for our world. A book more timely and intensely important than even when it was first published!